The Nokia 8110 4G Banana phone is finally priced in the Philippines. The feature phone comes with a 2.4-inch display, 4G LTE connectivity. Back at the Nokia 7 Plus Philippine launch event, we were jolted with a bit of nostalgia when the company teased the arrival of the Nokia 8110 4G in the country. This time, the date has been set and the price finally revealed. The Nokia 8110 4G will be available in the Philippines starting May 14, 2018 with a suggested retail price of PHP3,990. Surprisingly, the phone is cheaper here than when it first launched in Europe earlier in the year. 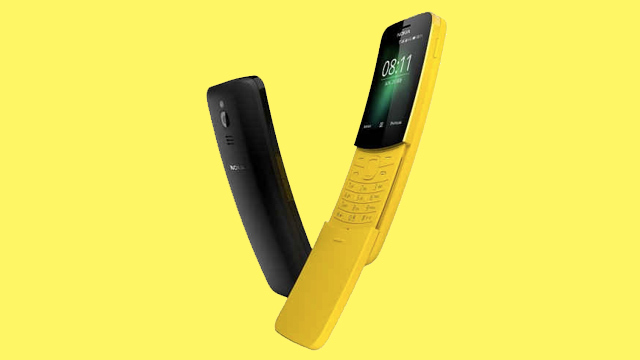 For those who missed it, the Nokia 8110 4G features a 2.4-inch QVGA curved display, a dual-core Qualcomm Snapdragon 205 processor, 512MB RAM, and 4GB of storage. The handset has a 2MP rear camera for quick photos. It does not have a front camera. Other features include 4G LTE connectivity, Wi-Fi hotspot support, a 3.5mm audio jack, and a 1,500 mAh battery. The Nokia 8110 4G will be priced at PHP 3,990 (roughly USD 78). It will be available in the Philippines starting May 14, 2018.